Thank You very much Sharon...nice to see you as usual. Rob...please have a look...got the info from Sharon's link...thanks! I think the aerial photo for KFXE/Ft. Lauderdale Executive looks like Carpe/Rob's photos. Thanks 2NJSons...found some links in case Rob checks back. These are the same airport. Thanks Rob...did you take a look at the other link? It looked similar, but I am not sure where it is in location to your address. Sorry totally photo and map challenged!!! OOPS....I posted Carpe....sorry, meant Grande. Mum, I put my 2 cents in, earlier, because I know Hollywood is south of Ft. Lauderdale. Was just thinking that the addresses in Grande/Rob map views were in Ft. Lauderdale proper and the airport would be closer. Thanks...should have googled the area...I am not familiar with that part of Florida at all. I suppose many airports use the same layout. I will go and find the map Rob did the other day of the location, seems I had a clue when he posted that! I am 'map challenged' myself, Mum. Especially when I can't 'zoom in' etc, to get my bearings with a local landmark. Ft Lauderdale Executive Airport -- unless there is another one by that name that I'm not familiar with -- is NOT in Miramar. It has been a very long time since I flew into Ft Lauderdale Exec -- but it was located about 5-6 miles north of downtown Ft Lauderdale. Grande's map - if it is Miramar -- cannot be Ft Lauderdale Exec. Unless the airport moved about 15 miles south. Which I guess is possible??? 2NJ Ft Lauderdale International also used to be known as (maybe still is) 'Hollywood-FtLauderdale' airport as it is south of downtown Ft Lauderdale. MIRAMAR is about 8 - 10 miles further south -- by the MiamDade county line. Ladies, Something just hit me. I think we found the airport that Oduber was flying in and out of when Natalee was missing. This has to be it. I can't see a head of State, even one like Aruba, using the Miami or West Palm airport. This must be the place. And Aruba Air is located right there. LOL...Rob...which one are we talking about! Fort Lauderdale Executive Airport. That has to be the one Oduber was using. George W Bush, Barack Obama, Hillary and Bill Clinton, John McCain -- to name a few -- always fly in and out of Miami International. 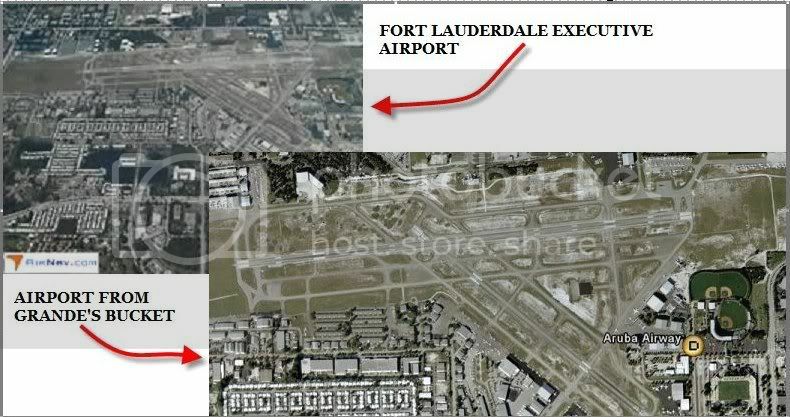 Ft Lauderdale Exec has 2 little runways. I'm not sure if you even can clear customs there??? Here's a pdf about North Perry airport -- which I think is the north part of Ft Lauderdale International. Also some aerials in there that may look like Grande's photobucket. I don't think Oduber has to clear customs as a head of State. But I'm not totally sure. And he can clear on Aruba if need be. There is also an 'Executive Airport' in Miami -- just north of Miami International. In Hialeah. just south of Miramar. A friend of ours used to fly in to that one all the time -- to get to the Dolphin's stadium -- which is in MIRAMAR. Thanks Rob! I am still trying to match one with your pic of Gabe's address...confusing myself as usual!! Thanks Sharon...that one of North Perry looks like Rob's pic to me...so I have been checking maps and going back to the link you gave. Just not sure if it is too far south like 2NJSons posted! Have more info .. will keep checking!!! I'll work on Gabe Leo later today when I have some time. I am going to have to get going here in a minute, so I'll see you all later when I have more time to play. Is this it Sharon? 3 miles from Dolphin's Stadium?